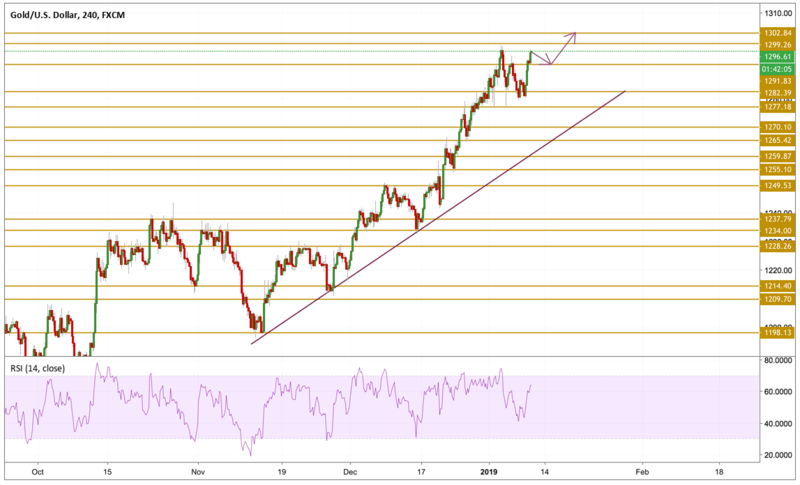 With the greenback coming under a renewed selling pressure during yesterday's session, Gold surged above the $1295 level till now after being in the red. The Dollar index lost its traction as the FOMC meeting minutes came negative with the Atlanta Fed President adopting a dovish tone similar to his colleagues by arguing that the Fed needs to be patient about the direction of the economy and the risks to the outlook. Today, Fed chair Powell will speak and he will certainly support the yellow metal if he sounds similarly negative. Gold prices surged during the second half of the day yesterday as they are back above the $1295 level near the tops. The price is currently hovering just below the $1297 level and now eyeing to break above the $1300 figure after an impressive one-month run by the bulls. The RSI points towards a strong bullish momentum far from overbought conditions but we have to be careful from divergences with the price. The next level we will be focusing on is the $1302.84 level.